Sometimes the world is awfully overwhelming and confusing. I can’t understand it. I have no hope of understanding it. Why is it that sometimes really really terrible things happen? How can I have been so infinitely blessed as to have been able to have spent the weekend surrounded by loving friends and family? Marveling at the beauty of lakes, trees, snow, and mountains. Belly laughing at stupid jokes or at each other as we careened down precarious slopes. Passing plentiful bowls of food and bottles of wine to each other reveling in the sharing. While, at the other side of the world our brothers and sisters were having the ground shaken out from under them, rocks falling on top of them. The fall out of nuclear melt down besieging them. There is no sense to it. No sense that my little mind can make of it. The world, life, is terribly beautiful and beautifully terrible. I suppose this is part of what makes it all precious, the very precariousness of it. It doesn’t serve us well not to accept the sadness as well as the happiness in life. But, still. Sometimes, I really just don’t think I can handle it. Sometimes I just want someone to hug me and say “it’s going to be alright.” And you know what? Sometimes I think that’s just fine. Sometimes we aren’t strong enough to hold all the joy and sadness, and there is no shame in that. And often in moments like these I also want comfort food. Something regressive, soft, simple. As a professional, I know I’m supposed to strongly counsel against emotional eating, or eating to comfort yourself. But honestly, you’d have to be pretty hard hearted never, ever to allow a person to indulge in a mug of warm milk with honey, or a bowl of mac and cheese, or a cup of pudding. Something to transport them to simpler times. This pudding will do just that. It is silky, smooth and chocolatey enough to soothe your spirit. Yet at the same time, it is rich, bittersweet, and sophisticated enough to serve even when you’re not escaping, but instead are impressing guests. 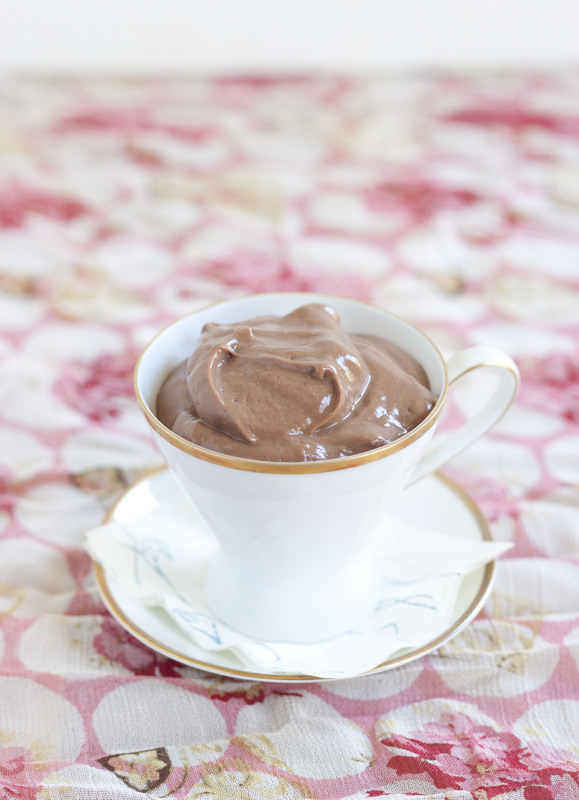 It is simply the ultimate chocolate pudding. It won’t solve any problems, but it’s pudding, it doesn’t need to. And if it brings a little comfort to someone, at least it’s a start. Sometimes we need a little softness and sustenance to give us the energy to help in other ways. My heart goes out to the people in Japan. And in looking for ways to help, here is a good list of organizations working there. 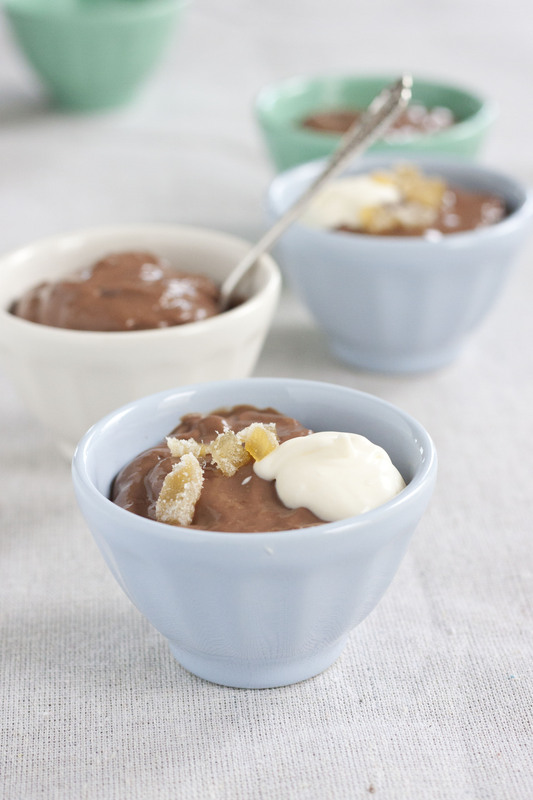 The secret of this chocolate pudding is that you caramelize the sugar before adding the milk. It doesn’t give the pudding very much caramel flavor, but it deepens and softens the chocolate flavor, lifting it to new heights. 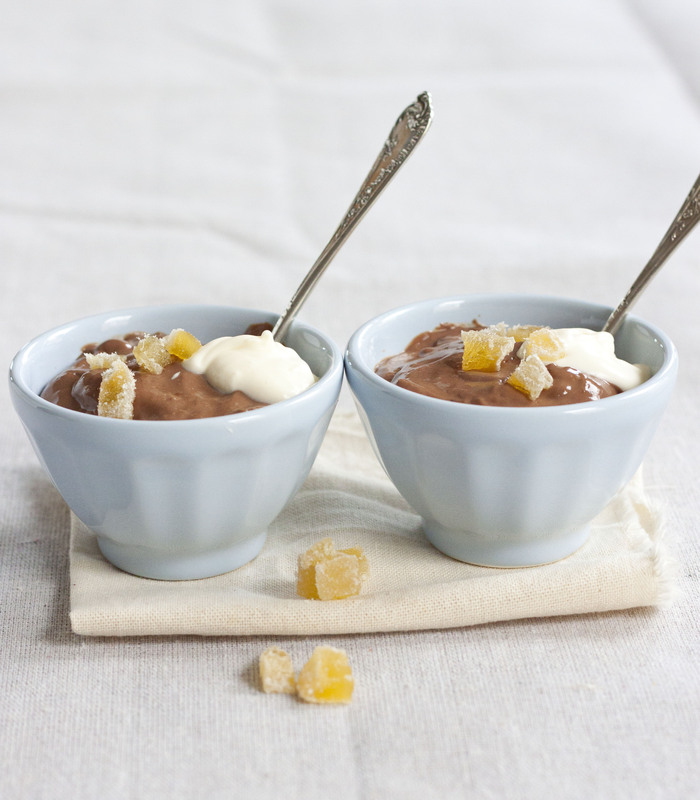 With a dollop of whipped cream or creme fraîche (and I love to toss on some berries or chopped crystallized ginger too), this pudding is perfect as an after school/work snack but could also be served in wine glasses at a nice party. In a small bowl combine the cornstarch and cocoa powder. Slowly whisk in 1/2 cup of the milk until the powders dissolve. Make sure there are no lumps. In another bowl (sorry for the high bowl usage!) whisk the egg yolks briefly to lighten them. Set to the side. In a heavy bottomed saucepan, heat the sugar over medium high heat until it starts to melt. As it starts to melt, gently stir it with a heat proof spatula until it is fully melted, then let it cook until it has turned a deep amber color – it will smell caramelly and almost be starting to smoke (this takes up to about 8 minutes, but you need to be vigilant the whole time). Turn the heat down to medium-low and pour in about a half cup of the plain milk. Be careful! It will hiss and splatter and the caramel will seize up, but don’t worry, it will be okay! Pour in the rest of the milk, bring to a simmer, and keep stirring until the caramel is all dissolved. At this point, stir in the cocoa and cornstarch mixture. Keep stirring over medium low heat until the mixture starts to thicken enough to thickly coat the back of the spatula. Turn the heat down low. Whisk 1/4-1/2 cup of the hot milk mixture into the egg yolks. Be sure to stir well the whole time to keep the yolks from curdling. Repeat twice with another 2 ladle-fulls of the hot milk. Now scrape the egg yolk mixture into the saucepan. Turn the heat back up to medium low and cook, stirring constantly, until the mixture is thick enough that the spatula leaves trails and if you lift it the mixture glops off instead of running off in a stream. Remove the pudding from the heat and add the chopped chocolate. Stir until the chocolate is entirely melted and mixed in. Finally stir in the vanilla and salt. If the pudding seems lumpy you can press it through a strainer into a bowl, but I generally don’t actually find this to be necessary. Pour the pudding into a bowl and place plastic wrap directly on the pudding if you wish to avoid a pudding skin forming. Put in the refrigerator and allow to chill for at least a few hours and up to a couple of days. When ready to serve, scoop the pudding into bowls. If desired top with dollops of the creme fraiche (first whisk the creme fraiche with the 1/2 tsp. sugar) and a sprinkling of chopped crystallized ginger, or some sweetened whipped cream (whip in a bit of espresso powder for a serious treat). You are currently reading Deeply chocolate pudding at Five And Spice.